With the price of oil now at $78, something I consider unusually low because Saudi Arabia rarely maintains its production amidst declining prices (usually, the Saudis run their oil spigots in a self-correcting manner, decreasing production during hints of substantial price declines and calibrating production increases as necessary during price hikes to keep energy prices in a desired zone), I have made no secret of the fact that I’ve recently been turning my attention towards oil stock investments. I think the prices for many have become attractive in their own right, and especially attractive on a relative basis compared to much of the rest of the blue-chip universe (though with Nestle now in the $72 range, it’s not like there aren’t any growth-at-a-reasonable-price blue chip investments out there). In a way, it almost doesn’t matter which oil giant you choose: BP. Total. Royal Dutch Shell. Exxon. Kinder Morgan. Chevron. Conoco Phillips. Phillips 66. Marathon Oil. They are all solid twenty-year holdings, and the kind of things that will generate a good chunk of income to you as you work through the next stage of your life. BP remains my favorite from a current dividend and future capital appreciation perspective (what do you think happens when you reinvest a 5.6% yield into an undervalued stock year after year while the dividend grows?) but I can also acknowledge that the company’s risk profile has heightened in the previous few months as well—after all, BP generates 30% of its production in Russia, and if these lower prices remain for twelve to twenty-four months, you could conceivably encounter a worst-case situation in which BP would have to pay out a high gross negligence ruling and sell its assets during a period of low prices and uncertain profits through its Russian production arm. That said, BP is still one heck of a bargain. I expect BP in the low $40s will be something that investors will look back on and go “D’oh, what was I thinking” for passing up the opportunity after fear. This is still a company with 5 billion barrels in reserves and 34 trillion cubic feet in natural gas to its corporate name, plus other partial interests. This is still a company that makes $14 billion in profits per year, roughly 1.5x the profits that Coca-Cola makes (and Coke operates in 210 countries). And they have $27 billion in cash currently on hand, and an adverse gross negligence ruling would cost somewhere around $18-$21 billion. Since BP is currently using some of that cash on hand to repurchase stock, believing (correctly in my opinion) that the stock is undervalued, it is possible they could have to sell a few more assets in a particularly bad case scenario. But on the whole, especially adjusted for the current price of $40 per share and likely considerations of where BP will be ten years from now, the concerns you hear about BP are largely headline risks that strengthen my belief that having too much financial information on hand can be hazardous because it is going to force some otherwise intelligent and good people to dispose of their stock out of fear when they would have been better off just going through life and letting the cash payments pile up. I continue to hold the opinion that most people underestimate how lucrative it can be having 15-20% of your portfolio dedicated to the assets of the old Rockefeller Empire (plus Total SA and Royal Dutch Shell). To illustrate the point, just look at this twenty-year chart of Conoco Phillips. 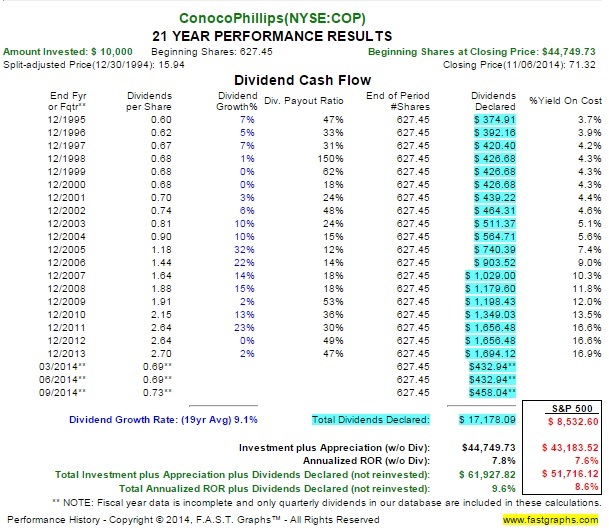 Without dividends reinvested, you beat the S&P 500 by a few percentage points, getting 12.26% annual returns over the past twenty years (you should note that the chart example just includes the pure Conoco stock, and leaves out the Phillips 66 spinoff which would have established a concomitant ownership stake of Phillips 66 as you received one share of Phillips 66 for every two shares of Conoco that you owned in April 2012). Even if you spent every single dividend payment along the way, the amount of income generated by your invested principal continued to march upward with time. And what I really like is that sloping upward yield-on-cost; after all, if you do it right, you’ll only live off the income and your beneficiaries and favorite charitable causes will reap the rewards of capital gains on the principal. In the case of Conoco, someone living off the dividends would have seen each share grow income production from $0.60 annually to $2.92 annually, so that the original 3.7% yield on the Conoco shares grew to a 18.3% annual yield on your invested money. Better yet, those Phillips 66 shares would be independently pay you a 6.27% yield on your initial investment as well. 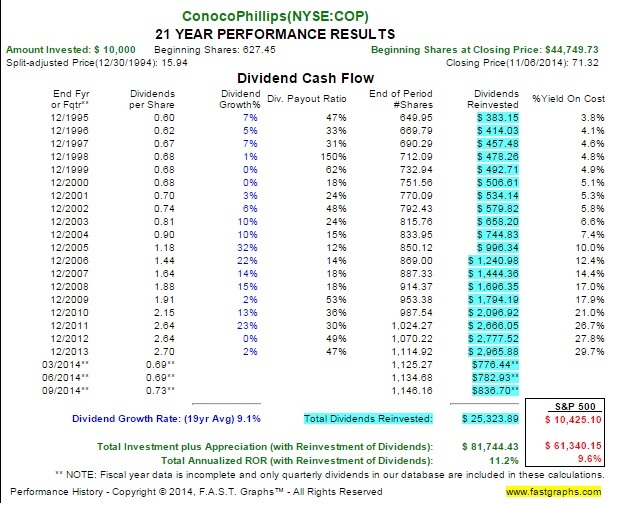 For someone with $10,000 to set aside towards Conoco in 1994, and chose not to reinvest, the results would look something like this: 628 shares of Conoco paying out $1,833 in current annual income, and 314 shares of Phillips 66 paying out $628 in current annual income. In short, you’d be getting $2,461, or 24.61% in annual dividends on the amount you invested twenty years ago. If you were in a situation where you were making much more than you needed to spend, and trying to create wealth rapidly that would generate significant annual income at a later date, the results would have been more impressive as you would have received 250% of your investment as cash to get plowed into brand new shares. This would have quietly almost doubled your share count over the past twenty years, amplifying the effects of future dividend increases and the value of those Phillips 66 shares. You’d currently be collecting about 33.46% of your invested capital in annual dividends alone. The Phillips 66 shares have only had two years of dividend reinvestment, so that part of the narrative is still young. There’s a lot to like about making the oil majors important parts of your overall investment story. They offer important hedges against inflation—if you’re worried that American politicians will turn to the continual creation of new currency to flood the market with electronic dollars to eventually create 4% or higher inflation (rather than raise taxes directly), then you can hedge against this threat by owning commodities stocks. When people talk about oil getting “expensive” this past generation—it wasn’t all attributed to oil becoming more expensive—it was oil getting more expensive in conjunction with the U.S. dollar growing weaker. Because oil stocks naturally fluctuate in prices quite substantially—BP and Conoco are going to see significant rises and falls in their stock prices much more so than General Mills and The Southern Company—I think some investors get scared off by that volatility. What I find interesting though, is how a few years of dividend reinvestment can hedge your starting investment against volatility as the years go on. This year BP has seen a high of $53 go down to $42 right now. People on TV will talk about the significant volatility of that. What’s missing is this: From 2011 through 2014, BP will have paid out $8.18 in dividends. Those $8.18 in dividends these past four years covers about 75% of this year’s volatility. And if you reinvested those dividends, the payouts would grow larger, smoothing out the fluctuations more. And that’s just four years of reinvesting oil dividends. If BP didn’t raise its dividend at all the next decade, you’d collect $24. That’s over half the share price, based on merely continuing the rate of the 2014 payout. The fat oil dividend payouts matter, and they mitigate against a lot of the short-term volatility associated with oil stocks. That’s why I find Exxon, Royal Dutch Shell, Chevron, BP, and Conoco to be central cast members in building an estate. Do Blue-Chip Stocks Stop Growing?